I get inspired in the most strange and bizarre ways. Sometimes I come up with ice cream flavors weeks in advance by methodically reviewing recipes from my ice cream cookbook collection. Other times I open my cabinets and see what goodies I have available, and begin concocting accordingly. This time, I wanted to make something chocolatey that was inspired by Sesame Street. Why? Because what grown up doesn’t love taking a walk down memory lane and relive ‘the good old days’ of apple juice, afternoon naps, and early bedtimes. Ah, to be young! I went to Trader Joe’s like usual and decided that I would find a new product on the shelf and make an ice cream with it…and that’s exactly what happened! While meandering through the aisles at Trader Joe’s I came upon two chocolates that I really needed to try. (Notice I said need not want – that’s the true sign of a dessert lover and inner little kid!) I felt a little gluttonous buying the chocolate bars just to eat them, so instead I put them into ice cream. Chocolate is much healthier chopped into tiny pieces, right? Right. 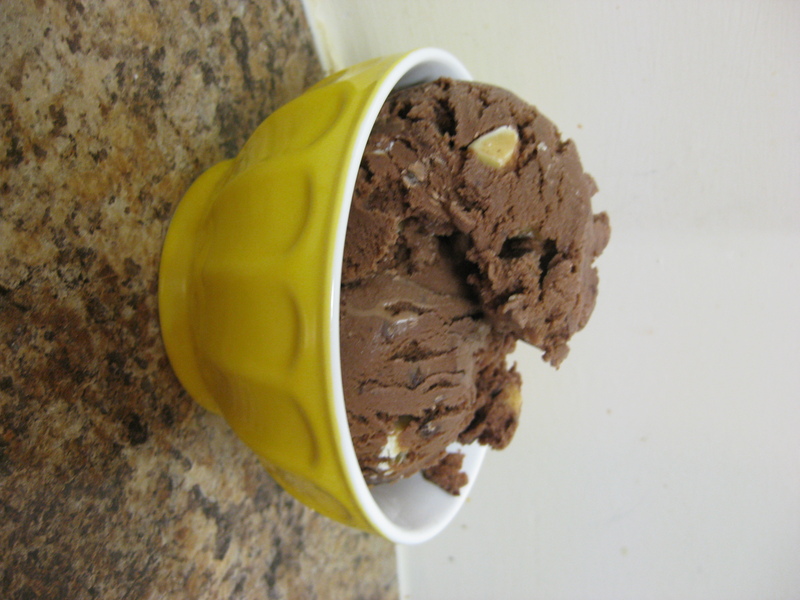 In my quest to make the best chocolate ice cream, I’ve tried David Lebovitz, Cuisinart reicpes, and now Ben and Jerry’s (each time, putting my own touches on them!). This time, I fashioned a double boiler (I don’t have one), used baking chocolate in addition to cocoa powder, and I have to say, Ben and Jerry did not lead me astray! I decided to name this ice cream “Truffle-upagus” because is the woolly mammoth of all chocolate ice creams; it’s one large and in charge chocolate beast! Between the creamy milk chocolate base, white chocolate chunks, and milk chocolate truffle bits, it’s truly a chocolate lover’s dream. Snuffleupagus’ nickname is also Snuffy, so if you’re feeling particularly spunky feel free to nickname this ice cream “Truffy”. Base adapted from Ben and Jerry’s, the rest is mine! 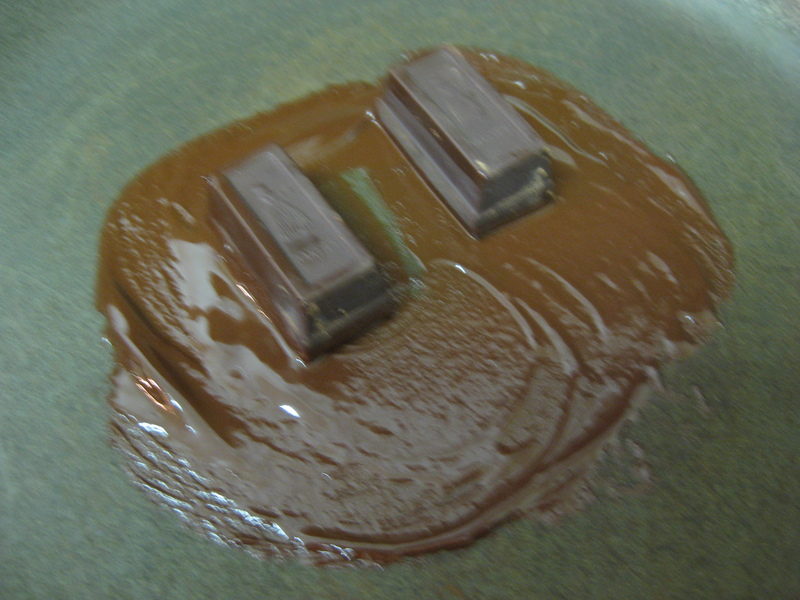 The chocolate melting in my "double boiler"
Help! The chocolate is seizing! Gradually whisk in the cocoa and heat stirring constantly, until smooth. 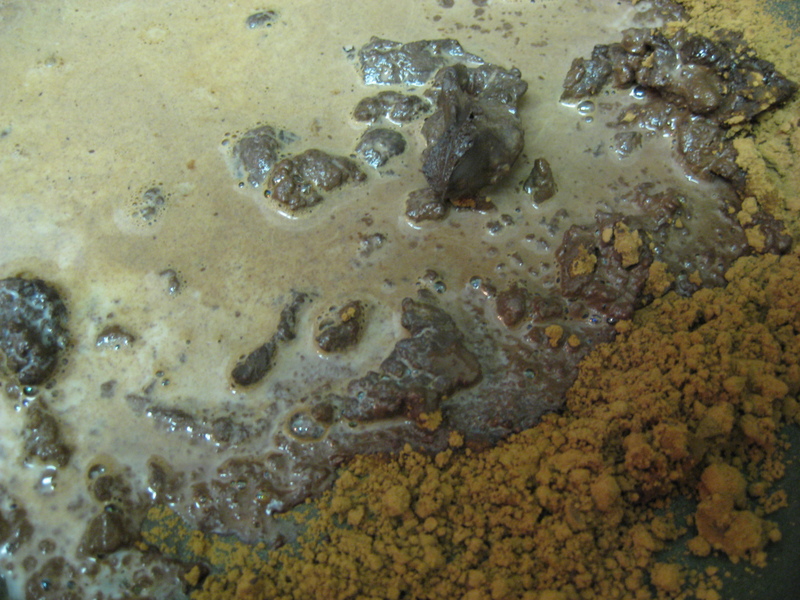 The chocolate may “seize” or clump together. Don’t worry, the milk will dissolve it! Whisk in the milk, a little at a time, and heat until completely blended. Remove from the heat and let cool. 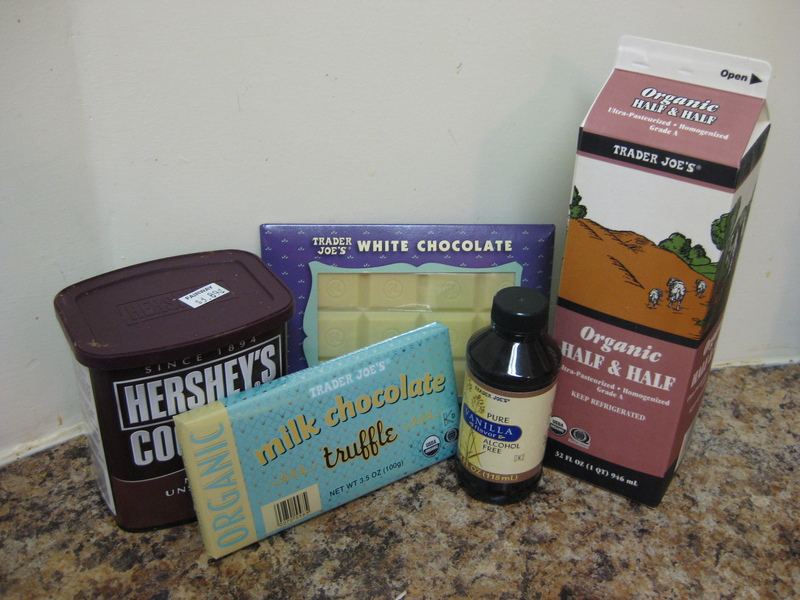 Whisk the “chocolate milk” mixture with sugar until it is completely dissolved. Add in the vanilla and mix thoroughly. Cover and refrigerate until cold, about 1-2 hours. 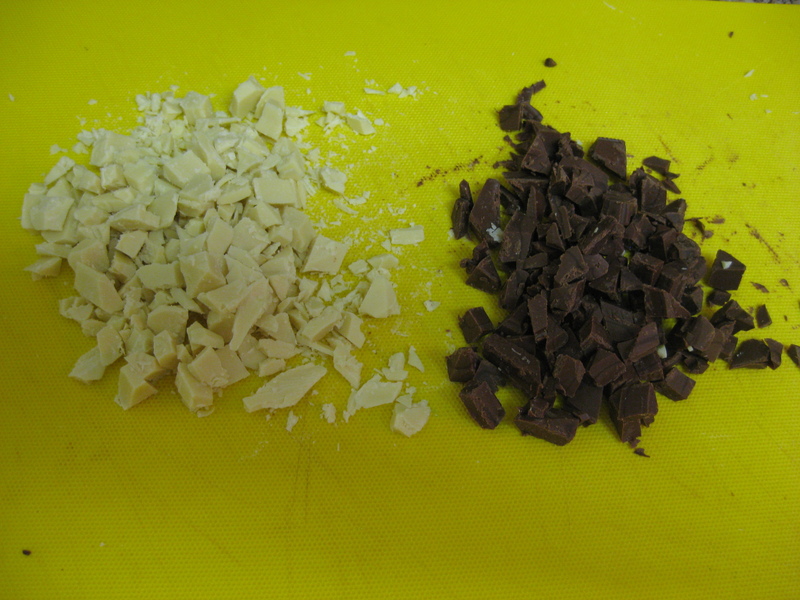 While the mixture is cooling, chop the chocolate and set it aside. Once cooled, transfer the ice cream mixture into an ice cream maker and freeze according to the manufacturer’s instructions. Approximately 3-5 minutes before the ice cream is done churning slowly pour in the mix ins so that the ice cream has the appropriate mix-in-to-ice cream-ratio. This ice cream can be eaten straight out of the machine, or for a slightly firmer texture freeze for approximately 1-2 hours before enjoying. The Verdict: Truffy! This happens to be one of my favorite ice cream bases. It was damn good. This is also the first quart of ice cream that I have not given away and as such, have enjoyed an actual bowlful myself! It’s funny, people always ask me “what does your freezer look like?” or “gee, you must be getting fat eating all this ice cream.” Newsflash: I give away 99% of all the ice cream. Let’s get real folks: we live in NYC, there aint no room in our freezer for all this ice cream. And, we aren’t looking to pack on the pounds right before bathing suit season :) In all seriousness, I much prefer to give it away – it’s good marketing for 365scoops! So, submit your flavor requests and I’ll happily make one for you. Until then, enjoy this delicious and creamy flavor. Yum. Yum.Yum.